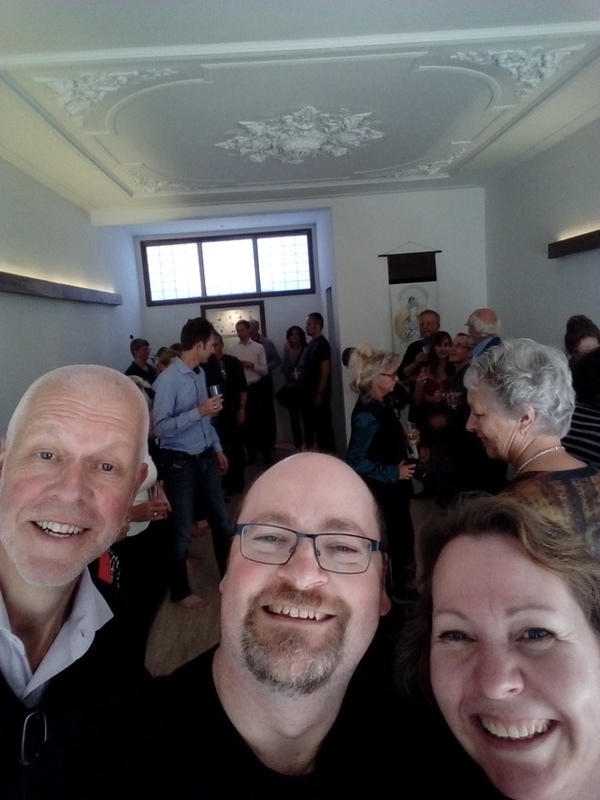 Saturday, we visited the city of Haarlem to attend the official opening of the new zendo there. The festivities were in two parts: there was a lecture by Rients Ritskes (founder of zen.nl), and then the official opening. Because there were too many people in attendance to fit comfortably in the zendo, that lecture was held in a former chapel. That was in a building that apparently served as the starting-point for the pilgrimage to Santiago de Compostella. 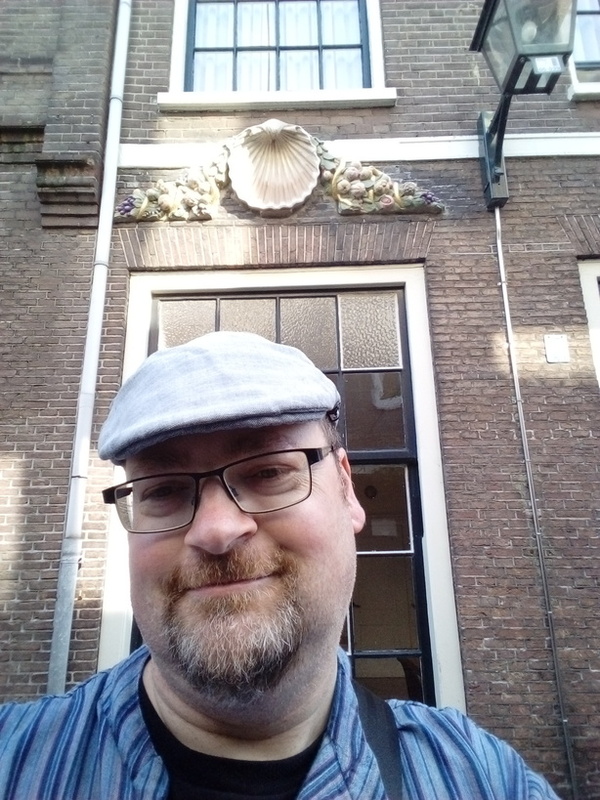 Therefore the chapel was dedicated to St James, and the exterior was adorned with mediterranean scallops (the Dutch name means “St James shells”), which are the symbol of the pilgrimage. Of course, the building hasn’t been in use as such for a long time, and now it’s some kind of community centre that you can hire for your functions. After the lecture, we walked through the charming city centre of Haarlem to the location of the zendo, which was then officially opened by cutting a ribbon and by a tea ceremony. There were drinks afterwards! 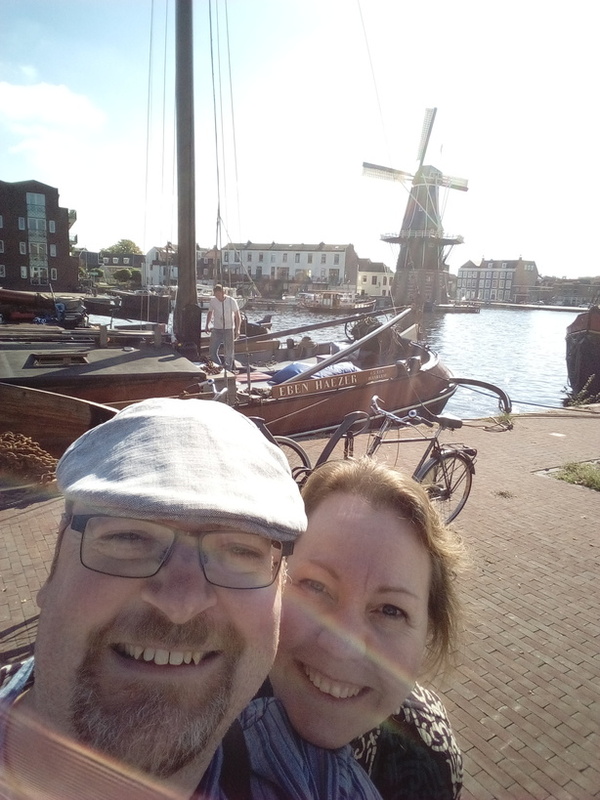 We left relatively early, and had dinner in Haarlem before returning home. A day well spent! Walking along the water. There were houseboats along the edge: not a bad spot to live! 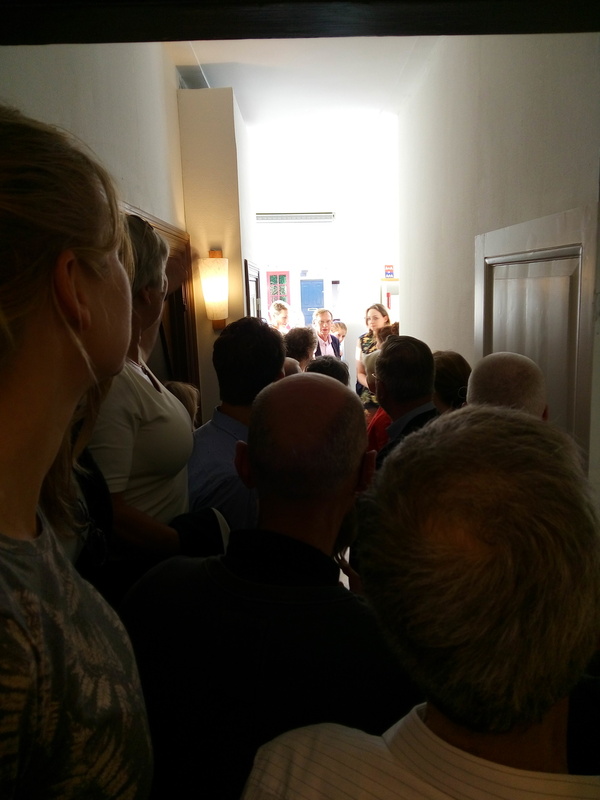 The official opening was a bit… crowded. Luckily we could all enter the zendo itself after the ribbon-cutting! The new zendo! It’s a really nice space with a very modern feel, combined with the traditional elements still present in the ceiling. Left: Rients Ritskes who posed with us for the crappy selfie! The new zendo does look very nice from what I can see. Very crowded opening indeed! Will your wife being working there? The houseboats and windmill picture is also very beautiful. I wonder if I could find something like a zen.nl near me. There are many yoga classes, but I don't know about straight-up meditation. I think I could use it! No, it's a 1,5 hour drive there, so it's just too far. Most classes are held in the evenings, starting at 20:00 and ending at 21:45. What with opening and preparing; and getting everybody out of the door and locking up, you'll easily spend two and a half hours. If you add in the travel times, then it just doesn't make sense to teach so far away from home. She is currently teaching in our hometown of Nijmegen on Wednesdays, and might get another lesson on Thursday evenings, about a 30 minutes drive from home. If I do a google search for "zen st louis", I find quite a few zen practices (along with a lot of restaurants that call themselves 'zen'...). All those practices are for Soto Zen, though, and Zen.nl is of the Rinzai Zen sect -- that makes quite a difference in approach. Both teach zen meditation, though, so if you just want to learn to meditate, then you could look those up. oo fun. that's exactly the kind of event i would enjoy attending. The owner of Zen.nl Haarlem (the lady in the background on the right in the last picture, with her head turned to the left) has retired from her 'day job' and has now started a new adventure. It was so good to be there to celebrate this moment with her, and with all the others present. it's hard not to like Buddhists (when they're doing it right). Great photos especially of you under the shell. Thanks! The distortion of the lens does weird things to the shape of my face, though. There is a reason I call such photos "crappy selfies". I notice how some of my own selfies make me look fuller in the face than I really am! Sounds like a good time! And who doesn't like to spend a day well? Wow, it really was crowded. Looks great though! Well, the zendo itself is of course large enough to accommodate the usual meditation group sizes. But yes, there were a lot of people crammed in the hallway. Once the ribbon was cut, we could enter the zendo and we all fit much more comfortable in the available space. The opening was clearly a huge success. 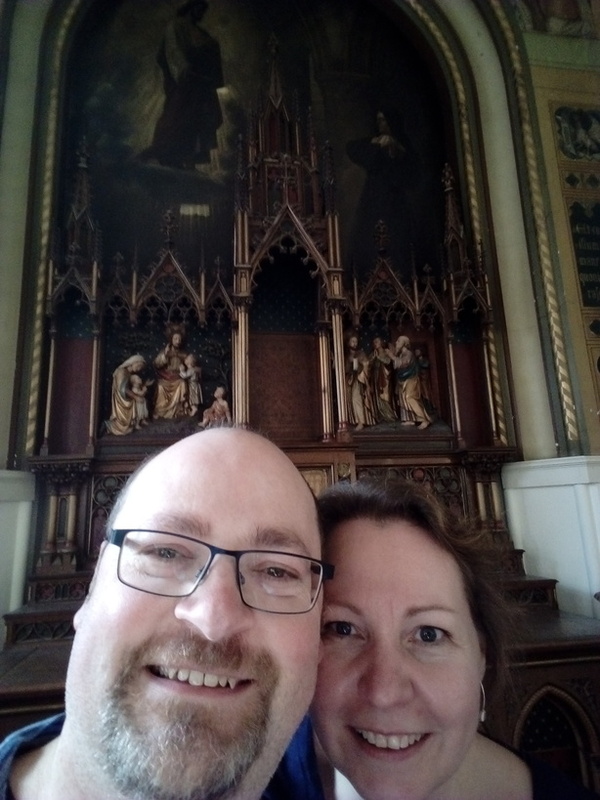 It seems that you and your wife had fun spending the day in Haarlem. You two look very happy in these pics, even if they have a bit of lens distortion. Your wife and you look absolutely adorable together!